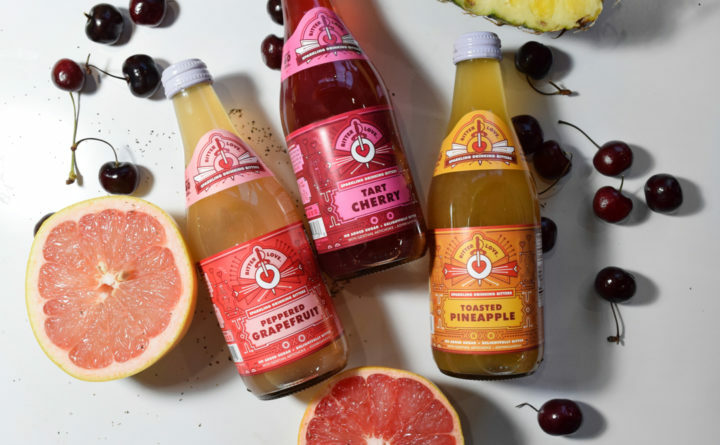 BitterLove's sparkling bitter beverage in its three flagship flavors: peppered grapefruit, tart cherry, and toasted pineapple. Besides some of the usual culprits — a cup of black coffee, a square of dark chocolate, a salad with a bed of crisp arugula — most of us can’t think of the last time we ate something truly bitter. The American diet tends toward sweetness, so we are often unaccustomed to how our bodies react to bitterness. Bitter flavors hit the receptors in the back of your throat. Too much, and it will make you gag. But bitter flavors can be found in other cuisine around the world. Chinese dishes mix bitter melon into stir fry. Middle Eastern tahini is made of naturally bitter sesame seeds. And a fine European meal will usually start with bitter aperitifs. Bitter flavors are thought to ready the digestive system, percolating its juices so that when you do dine, you enjoy it more. Taja Dockendorf and Alexandra Noyes want to challenge the American aversion to bitterness. Together, they created Bitter Love, a sparkling drink that falls somewhere between seltzer, kombucha and Negroni in flavor. With their drink, they hope to fill the bitter hole in in our dietary days. Bitters, the eponymous liquid made from infusing herbs, roots, bark and other natural ingredients, have long been used in cocktails and craft beer. Bitter Love takes that taste and puts it in a “functional beverage,” a drink has health benefits besides quenching thirst. Think kombucha, but instead of probiotics they use herbs. Bitter Love’s basic formula consists of a bitter blend, a splash of juice (no added sugars, of course), lots of water, and a combination of five dehydrated herbs: gentian, ginger, ashwagandha, artichoke leaf and wormwood. Noyes and Dockendorf are careful with their words — the Food and Drug Administration has not verified many of the health claims made about herbal remedies. But the herbs have long been used in traditional medicine to aid with digestion, stress and inflammation. Noyes points out ginger ale is often used to settle upset stomachs, even though it contains much more sugar than ginger. “Do not carbonate cayenne,” Dockendorf laughs. “Rosemary essence and extract is very potent,” Noyes adds. After plenty of trial and error, Dockendorf and Noyes landed on their three flagship flavors: toasted pineapple, tart cherry, and peppered grapefruit. The colorful qualifiers are used to distinguish the flavors from their candy-sweet counterparts that saturate the food and beverage market. With the flavor profiles perfected, the team brought science and beverage consultants on to finalize the process and scale up production. Given the culture of the natural foods industry, sustainability quickly became a consideration. For now, the ingredients are all non-GMO, and they are working toward finalizing their organic certification. “One of the benefits that we have being in the industry is there are a lot of people we can call with questions about the integrity of our ingredients,” Noyes said. This is especially important considering that gentian, one of the ingredients in their herb blend is considered an endangered herb. Bitter Love has not been on the market very long — the product was launched in November 2017 — but its founders are optimistic about the future of bitter sodas. BitterLove works with two local distributors to sell their sodas in natural food stores across the northeastern United States, including the Natural Living Center in Bangor, Tiller + Rye in Brewer, Acadia Provisions in Ellsworth, and the New Natural in Camden. Additional vendors can be found using the store locator on their website. The sodas are also sold nationwide through the company’s website and Amazon. Since the days of Dockendorf and Noyes experimenting in their kitchen, Bitter Love has grown into a team of four women, all of whom have previously worked in the natural food industry in some capacity, and all of whom reside in southern Maine.